Lab suppliers interested in working to sell lab equipment and market life science solutions in Washington may want to take a closer look at Biotechnology Calendar, Inc. Seattle life science marketing events in the region. Our Hutchinson Center BioResearch Product Faire™ Event at the Fred Hutchinson Cancer Research Center is scheduled for October 23rd, 2013. Last year, 151 people attended the Hutchinson Center BioResearch Product Faire™ Event. Eighteen of those attendees were purchasing agents, professors, and post docs, and 8 were lab managers. These attendees came from 10 different research buildings and 20 departments around campus. Our life science marketing events offer lab suppliers the opportunity to meet with researchers in a comfortable and convenient setting. Fred Hutchinson Cancer Research Center receives a great deal of life science funding available to researchers and lab suppliers working to sell lab equipment and market life science solutions. In 2012, Fred Hutchinson was awarded $223.9 million by the NSF and NIH. The NSF awarded the center $878,057 in research funding. In addition to receiving NSF funding, Fred Hutchinson Cancer Research Center received $223 million in life science research funding by the NIH in 2012. For more funding information on Fred Hutchinson Cancer Research Center, please read our blog article Research Funding Totals $223.9M at Fred Hutchinson Cancer Research Center. 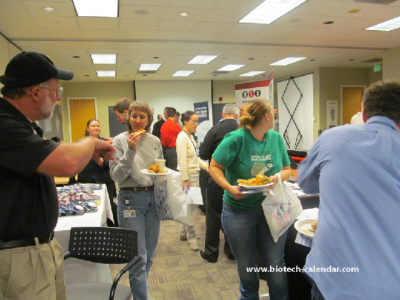 Researchers love attending Biotechnology Calendar, Inc. life science marketing events because they are able to network with others in their field and talk to exhibitors about the latest and best life science solutions, all while enjoying a free catered lunch. Exhibitors value our events because they offer the opportunity to meet researchers, lab managers and purchasing agents in just the space of a few hours. Our pre-show advertising helps to draw great crowds to our events, and our signage marketing participating companies provides great name recognition that will stick with attendees. Some of the best sales reps at our shows know that talking with customers or potential customers face-to-face is the best way to build trust. A Fred Hutchinson researcher who meets a lab supplier at Biotechnology Calendar, Inc. life science marketing events will know whether they want to be a part of a customer/supplier relationship if the sales rep takes an interest in their work and tries to help them find the missing piece in their research process. If you are a sales rep and you simply canvas the Fred Hutchinson campus, going from lab to lab to meet researchers, it will be much more difficult to sell lab equipment. Researchers may be too busy to talk, and you will have to factor in the time spent walking. This could prevent you from having enough time to be able to show interest in their work. Our life science marketing events provide a comfortable atmosphere where researchers have purposely taken time out of their day to talk about new life science solutions. These events are indeed the perfect opportunities to meet researchers. 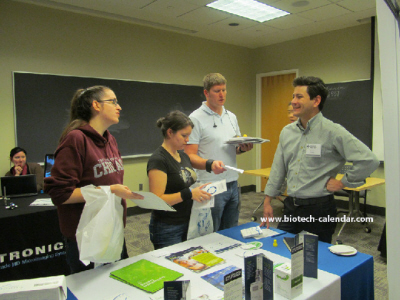 Biotechnology Calendar, Inc. invites all lab suppliers to exhibit at our Hutchinson Center BioResearch Product Faire™ Event on October 23rd, 2013. Biotechnology Calendar, Inc. is a full-service science research marketing and events planning company that organizes life science marketing events at top research institutions nationwide. If you are interested in working to sell lab equipment and market life science solutions at life science marketing events closer to home, we encourage you to view our 2013 calendar of events and our 2014 calendar of events. For more information on the Hutchinson Center BioResearch Product Faire™ Event, or to view more funding statistics for Fred Hutchinson Cancer Research Center, click on the button below.